Twenty years ago, back in the “good old days,” when Rambo still fought alongside the Mujahedeen in Hollywood and Osama bin Laden still worked in Afghanistan for the U.S. Department of State, I discovered I had a problem. Back then, as a newly “reverted” Muslim, whenever I went to the mosque, people kept handing me leaflets, advertisements and calendars with snippets of the Arabic Quran on them. And although they meant well, pretty soon, those leaflets started to pile up at home: because although I realized I couldn’t just throw them out in the garbage like any other trash, I didn’t know what else to do! However, when I brought my conundrum to the imam I learned the answer was actually an easy one with a long scholarly tradition to support it. He told me the most respectful way to deal with God’s message to Muslims — in it’s original Arabic format — was to burn the paper and ink it was delivered with, and give God’s message back to God. So when Quran burning first hit the popular media a few years back, I have to admit I didn’t really understand what the problem was. Obviously, someone idiotic enough to want to burn God’s message to God’s servants without even reading it wasn’t going to respect it, no matter what else he did with it: I figured sending it back to our shared Creator was the probably the wisest thing he would ever do! So despite the heat of current controversy surrounding the U.S. Army’s recent attempt to burn old Qurans in Afghanistan, if Muslims are being honest, we’ll admit that burning them is one of the ways Muslims discard old “well-used” Qurans, too. Granted it’s not preferable: Qurans deserve better treatment than short snippets of phrase, and so an honorable burial, or being sunk to the bottom of a running stream, is better. Regardless, it’s not the paper or the ink that really matters, it’s the message those words deliver that Muslims love the most. And to honor that message, when the vessel that contains it no longer proves adequate to God’s purpose of high-fidelity transmission, we give it back to God. However, a better way to honor it is to actually live by it, and frankly, that’s where we seem to be falling short these days. Now, don’t get me wrong. I understand why Muslims get upset with non-Muslims disrespecting our religion. But the thing is, our religion has very specific advice about what to do when that happens! And no-where does it say we’re supposed to kill or be killed! Instead, even though honor mattered to pre-Muslim Arabs in Muhammad’s day as much as it seems to matter to Muslims today again, since it didn’t matter one whit to Muhammad back then, it still shouldn’t matter to Muslims now at all. He told his followers very specifically that his honor wasn’t worth getting hurt for, and even with an army behind him he wasn’t willing to fight for it himself: In fact, while Muhammad was alive he brought the way Arabs worshiped honor over life to a crashing end. Don’t believe me? Check out what happened at Hudaybiyyah. Because what happened there brought peace to the Middle East for Muslim and non-Muslim alike, which was one of the main purposes of Muhammad’s Islam. Now it seems we’re back to where we started: Our world is being torn apart by tribal, national and religious chauvinism, just like it was being torn apart back then. However, the good news is, Muslims generally figure that what worked back then should still work today, right? And that’s the message we should be focused on, because it’s not just the Muslims who aren’t following their book, it’s everyone else too. America today, despite invading Iraq and Afghanistan, an invasion that’s resulted in the deaths of tens of thousands of innocent men, women and children for the sake of vengeance and American security still considers itself a “Christian” nation. And didn’t Jesus once say something about turning the other cheek? And while we’re at it, God was pretty clear in the beginning, that He was putting the Jews in charge of the Holy Land because they’d bring God’s benevolent Justice, and God’s benevolent Peace to all people’s living there, something the Quran confirms. Israel wants security, and Palestine wants justice. Judaism and Islam, on the other hand, both say you’re not following either religion until you want for your neighbor what you want for yourself. So while like every other Muslim out there I honestly believe that Muhammad’s Islam holds the answer for everyone, it’s not like you might think, if you don’t know Muhammad like I know Muhammad. Because if you go by the actual record of what he did, rather than the rhetoric that surrounds it, Muhammad didn’t bring God’s peace by making everyone live up to Muslim standards. No, he made everyone live up to their own standards instead: He made Christians be better Christians, he made Jews be better Jews, and he made Muslims be better Muslims. So what he did? Well, I think that’s what we should do too. 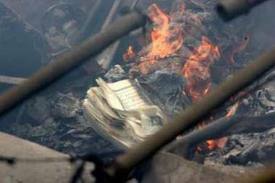 And enough about Qur’an burning! ← Food Justice Internship: APPLY TODAY!!! I am so glad to see that there are Muslims in the world that are wise enough to research their religion and learn the truths behind it, instead of acting on the rhetoric of fundamentalists. No religion is perfect, and each one will have extremists that ruin it for everyone else. This applies to all religions. The commonality is that we strive to be closer to God, and in doing so, most of us know that it’s about respecting each other’s beliefs and finding ways to live together in peace. Unfortunately, I believe that radicalism can only be addressed from within. Just like the Christian faith went through a difficult reformation, Islam needs it’s own reformation. The “infidels” can not do it….. The only way we will ever see stability is when like minded, properly educated Muslims, spread their knowledge to their fellow Islamic brethren. Thank you for this article and for showing the world that YES, we can all live together. All we need to do now is just educate the less fortunate and God willing, make a change for the better.